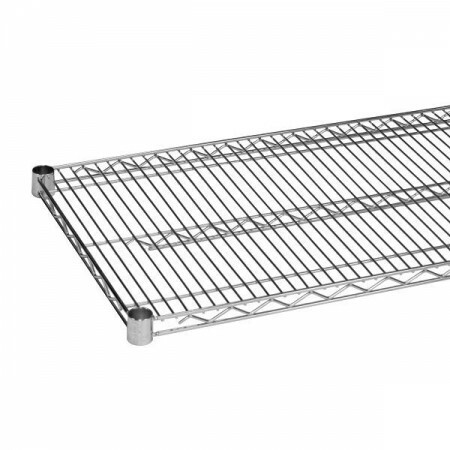 $74.99 Advance Tabco EG-2160 Green Epoxy Coated Wire Shelf21" x 60"
$32.15 Winco VC-2160 Chrome Plated Wire Shelf 21" x 60"
$31.37 Winco VEX-2160 Epoxy Coated Wire Shelf 21" x 60"
Use the Thunder Group CMSV2160 Chrome Wire Shelving 21" x 60" for storing a wide variety of items, like canned goods, containers, and more. Designed with vertical ribs, this shelving piece allows for easy loading and unloading of items while its vented design facilitates proper air circulation. Thanks to its chrome-plated metal construction, this wire shelving is strong enough to hold heavy items without warping making it an economical storage option for foodservice facilities.